INQUIRY/ORDER Link below. Please review the following before placing an order. Please include your address with your order - an address is most helpful. Pricing includes USA/Canada postage. Payment is AFTER receipt. Paypal preferred. personal check, OK. Again, include name and address with order. See payment details and order link below. See INVENTORY NOTES and explainations at bottom of page. 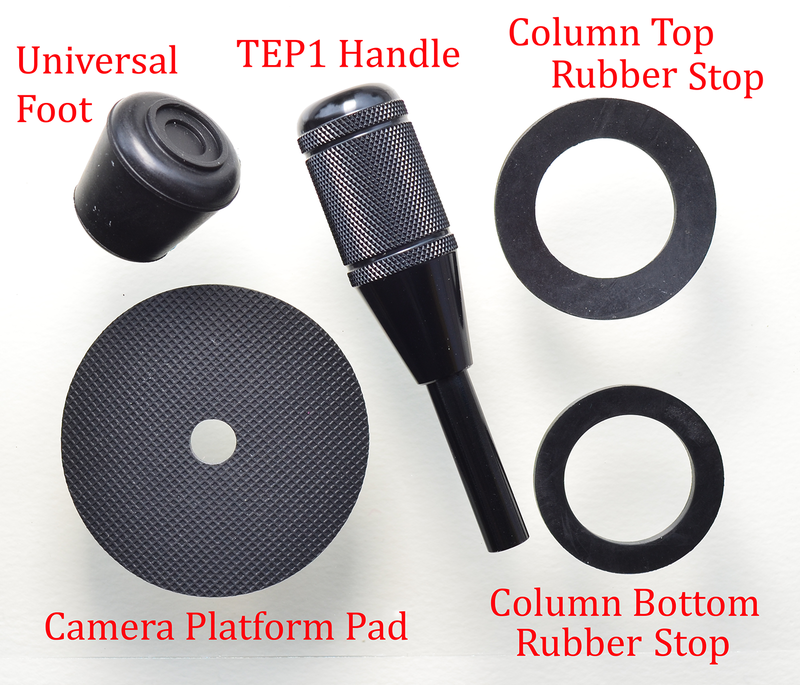 ORDER INFORMATION- This is a very informal support effort for Tiltall tripods - replacement parts post out of Colorado without a formal invoice. Pricing above includes shipment by post within the USA and Canada - postal charges beyond US/Canada will be added at direct cost. HONOR SYSTEM- To simplify ordering and possible return (next), please return payment only AFTER you receive the part and are happy and satisfied. PAYMENT- Paypal is prefered to garyregester(at)gmail.com Personal checks, money orders are, ofcourse, good as well. Barter is possible. Sorry no credit cards as the time/cost to charge and uncharge credit cards if the part is returned is much, MUCH greater than the actual part price. LINK to INQUIRY/ORDER page. Please include your name and postal address when placing your order!! NEW OPTIONS from us. 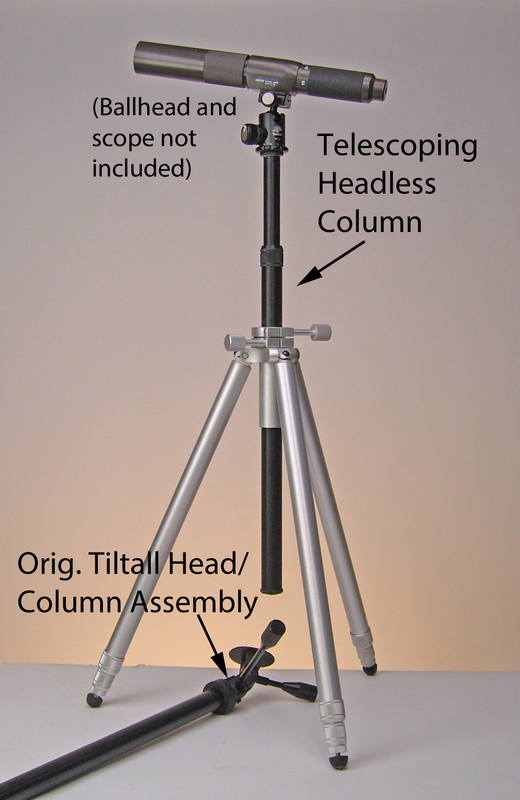 Telescoping and Headless MONOCOLUMN - (Black finish only) - extends camera 18 inches higher than original Tiltall head/column. Price: $55 USD incl. USPS Priority 2nd Day service in USA. Others, please inquire. Click on photo to enlarge. (Monocolumn does not include the ballhead or the scope - we do not plan to sell monoballs - see blog). Notes: These headless monocolumn are compatible with KingHome, Leitz, StarD NY, Unifot and Omicron versions of Tiltall. The later Marchioni (shouldered version - see blog) is compatible with a inner bushing change. The original "shouderless" Marchioni lacks the inner bushing and some machining of the tripod would be needed - not recommended. Adaptation to the other versions of Tiltall may need some adjustment of this inner bushing for optimal up/down adjustment as the ID of the Tiltall and its column has changed slightly in the six iterations from the Marchioni to the present KingHome. 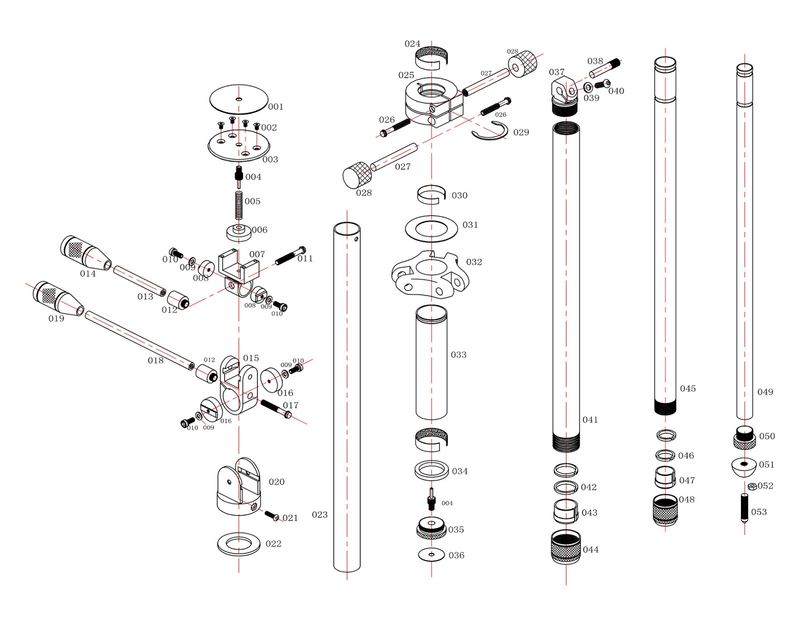 All of the removable fiber or plastic bushes need to be "considered" with the headless monocolumn for best fit - the Marchioni and Leitz used a thicker fiber bush and they need exchanged for thinner - keep your original for re-use of your Tiltall column. The StarD, Uniphot are OK with existing bushing, but I recommend a thinner bush. The Omicron and KingHome should need no change. BETTER OPTIONS from others - Column rubber stops - top and bottom - are more easily and cheaply found in the plumbing section of a good local hardware store, Home Depot or Lowes. The center column of the Tiltall is 1.25inches - so, the same diameter as a P- or S-trap drain assembly under your sink. Use a "square-cut" slip joint washer for the column base stopper and a "basin mack gasket" for the top rubber stopper. See next two screensaves. 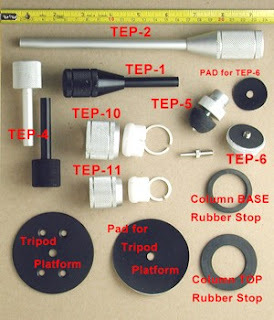 TEP HANDLE INSTALL NOTES: if you have earlier Tiltalls - Marchioni, Leitz, Uniphoto or StarD - you may need a "sleeve" to "shorten" your too long attachement bolt - see blog here and here. If you live 100 miles, more or less, from the nearest Lowes or Home Depot, let me know. Reference photo of parts, many no longer offered. TEP4 - My TEP handle shipment arrived October 2014 and contained a re-designed TEP4 - a smaller version of the bullet shaped TEP1. My opinion is this new design is TOO small compared to the discontinued squared TEP4. I will no longer offer either the TEP4 nor the longer TEP2 - see reference photo to left. I receive very few orders for the longer TEP2 handles. The one short coming of the Tiltall is what to do with this longer handles when traveling (hide it up the column). Best just get a TEP1 for all four placements. TEP5 FOOT - the "Unifot" foot design is not longer continued by King Home Taiwan, the current owner of Tiltall. see blog for foot details. If you want to keep your TILTALL with original parts, search eBay for an identical Tiltall by the exact maker of your Tiltall - there are seven different manufacturers. Then blend the two into a great re-newed single Tiltall - then part out the rest. The NEW CAMERA Platform and pad design is greatly improved (raised edge, stronger) over any earlier iteration - you could consider the pair as an improved retrofit. However, the pad is thicker than any earlier version, so make certain that your thread, which might be worn, can still engage your camera. Dealer Inquiries, with apologies, we have no dealer program, but I would be happy to put you in touch with Oliver Yang, KingHome, Taiwan.